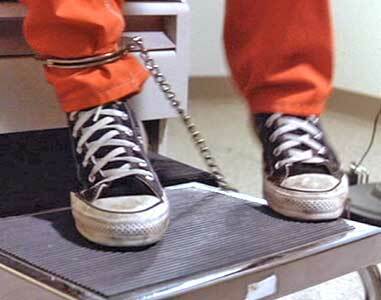 Jon Seda wears black high top Converse “Chuck Taylor” All Stars in the film. A bitter and desperate Brandon “Blue” Monroe forces a scared and reluctant Dr. Michael Reynolds at gunpoint to drive him away from captivity. The Sunchaser is about two people from very different backgrounds whose lives cross through an unusual crime and the ensuing circumstances. Dr. Michael Reynolds (Woody Harrelson) is a very successful oncologist at a prestigious Los Angeles hospital. Harvard educated in medicine, the self-absorbed doctor is up for promotion to head of the oncology department. He comes from a wealthy family, drives an expensive Porsche, and is arguing with his wife over the purchase of a showcase multi-million dollar home in Beverly Hills. Brandon “Blue” Monroe (Jon Seda) is a violent, street-smart, 16-year-old juvenile offender from east Los Angeles, serving time for murdering his abusive stepfather. But Blue has another problem: he is dying of cancer caused by a huge tumor. As the film opens he has been brought as a ward of the county to the hospital where Dr. Reynolds is on staff because his condition is rapidly deteriorating. Due to circumstances, Dr. Reynolds is assigned to examine Blue. At their first meeting, Blue is very hostile, smoking a forbidden cigarette in the examination room, and not acting in a cooperative manner. But Blue does want to know the truth about his condition, so eventually he submits to an examination. Dr. Reynolds quickly realizes that Blue’s situation is terminal, and leaves the room to discuss his options with two other doctors. Using a stethoscope that has been left in the room, Blue works his way to the wall, even though chained to the examination table and overhears that he only has a month to live. Now Blue, who is partly Navajo, is determined to escape and spend his last days at a mountain lake sacred to the Navajo people that he has read about in a book he carries with him. The prison guard, Blue, and Dr. Reynolds leave the hospital at the same time. The main action of the story gets underway when the other doctors advise Reynolds that his patient should go to another facility for a massive chemotherapy treatment. In the meantime, Blue’s fellow gang member has hidden a gun in hospital restroom, and when Blue gets a signal from him, he tells his guard that he urgently needs to pee. After the prison guard, Blue, and Dr. Reynolds leave to go to the other medical center, Blue fakes passing out. The guard pulls over and with his red light signals Dr. Reynolds to stop. When the guard releases Blue to check on him, Blue pulls out his gun and overpowers the guard. When Dr. Reynolds approaches to assist in what he figures is a medical emergency, Blue forces him at gunpoint back to his car and the two drive away to east Los Angeles. After driving by a crime scene with two dead bodies, Reynolds is forced to abandon his Porsche Blue steals a less conspicuous car and forces Reynolds to drive it to a chop shop where his friend who brought him the gum works. The car is repainted and fixed up with stolen plates. The two then drive off toward Arizona. Michael and Blue are stopped at a gas station on their journey to the sacred Navajo lake. The film now switches into a road trip mode, with a number of interesting characters, and continual conversations between Blue and Michael. Blue continually tries to show the doctor that he is in charge and in control of the situation, while Michael tries to explain that if Blue doesn’t get immediate medical treatment, he most likely will not make to where he want to go. Also entertaining are the interactions between the doctor and various people they run into on the way, including a waitress, a convenience store clerk, and a new age older woman who do not respond well to the doctor’s medical opinions. Back in Los Angeles a search begins for the doctor after the authorities eventually figure out what happened and they find the shell of his stripped down Porsche Later, Reynolds is suspected of having helped Blue because he was the one who signed the paperwork that mandated Blue be transported to another hospital for treatment, and it was while he was being moved that he escaped. When Michael is able to get to a telephone and call 911 from a cafe in Arizona, the search intensifies and moves to Arizona. Angered that Reynolds tried to escape, Blue tells some nearby bikers that the doctor tried to molest him. They start to beat Reynolds up, and throw him outside to finish the job. Realizing that he made a big mistake, Blue brings the car around and rescues Reynolds. Some intense action follows as they drive away, pursued by the bikers in a pickup truck. 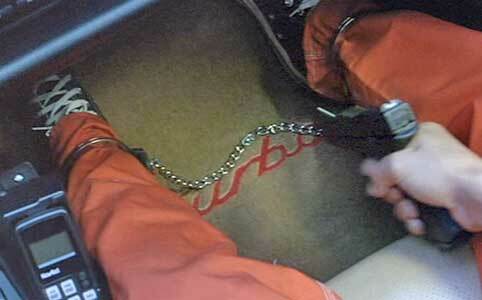 The two escape and gradually things begin to change in their relationship as kidnapper and hostage. The two actually start communicating through some intense confrontations, and eventually the doctor ends up deciding to help Blue in his quest to find the sacred mountain lake. The key to this change is when Blue tells Dr. Reynolds the story of The Sunchaser, a Navajo healer with special powers, and Reynolds flashes back to images of his brother Jimmy in a hospital, dying from a terminal cancer and begging Michael to end his suffering. Blue sits on a cliff at the edge of the valley where he is headed. The Sunchaser is an interesting character study in how people from the most different kinds of backgrounds can eventually relate to each, even under stress. While there was a spiritual element to the story, the characterizations still remained grounded in everyday reality during discussions about medical matters and personal lifestyles. Jon Seda gave a powerful performance as the tough kid who stakes everything in the remaining days of his life on finding that mystic lake in the Arizona mountains. Dr. Michael Reynolds was a somewhat unusual role for Woody Harrelson, but he did have some good moments as circumstances eventually forced the uptight doctor to examine his own life and humanity. The script was intelligent for the most part, and had a few funny moments in contrast to its generally serious subject matter. The story had everything from car chases and LA crime scenes to discussions of medical ethics and spiritual values. The film provides one with a cross section of American life, not only in the story line, but in the beautifully shot scenery, especially toward the end of the story. It’s not often that you find a crime drama that has this many layers of interest in it. Of course this meant that Hollywood didn’t really know how to market this film, and so it didn’t get the distribution it deserved. Do check it out if you get the chance. Near the end of their journey, Michael must carry the very weak Blue. 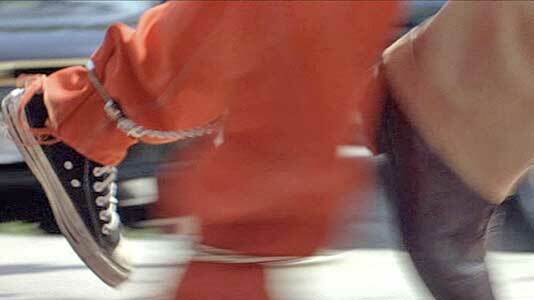 Blue’s ankle is chained to the examination table in the hospital..
Jon Seda in his role as dying gangbanger “Blue” Monroe, wears black high top chucks throughout the film. 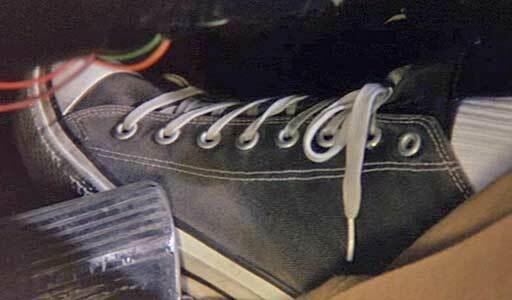 The cinemaphotography is particularly chucks-friendly in places, and shots of Blue’s chucks are used to show the action in a number of key sequences during the film. The first is when Blue is in the hospital examination room, the second when he climbs up on the toilet in the hospital bathroom to retrieve a weapon left by one of his friends, the third when he is forcing Dr. Reynolds back into his car to make his escape, the fourth when Blue wants Reynolds to drive faster, and the fifth near the end when Blue is struggling to climb the mountain to get to the Nirvana he seeks. The camera focuses on Blue’s chucks as he seeks to find out what the doctors are saying. Later he gets up on the toilet to retrieve a gun left by his friend. 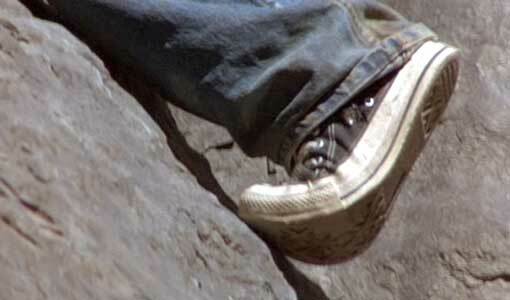 The camera again focuses on Blue’s black high top chucks as he forces Dr. Reynolds back to his car at gunpoint. Blue goes to fire a shot in the floor of Dr. Reynolds’ Porsche to make him drive faster. Then he puts his foot on the accelerator. 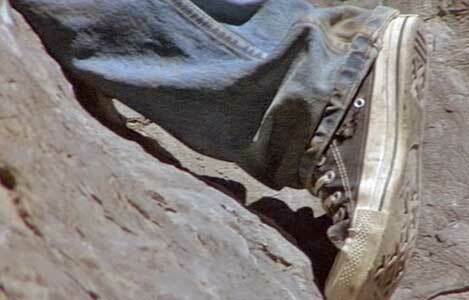 The camera again focuses on Blue’s black high tops as he struggles to climb the mountain. The Sunchaser. (1996) Woody Harrelson, Jon Seda, Anne Bancroft, Alexandra Tydings, Matt Mulhern. Directed by Michael Cimino.